Welcome to the website for the HOSE CO. NO. 3 - Fire Museum in Pueblo, Colorado. 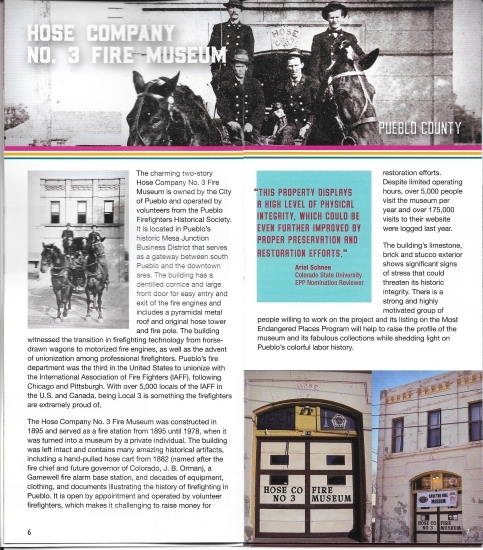 The fire museum is operated by the Pueblo Firefighters Historical Society, which is dedicated to the preservation and presentation of the history of the Pueblo Fire Department and its firefighters. Keep checking back for more Ghost Investigations at the museum. We will add them periodically. We are located in the heart of the historic Mesa Junction area of Pueblo, just 1/2 block from the architectually stunning Rawlings Public Library, and 1/2 mile from the historic Union Avenue District. To schedule a tour, please call Gary Micheli @ (719) 821-1273 or by e-mail at gmmpf@hotmail.com. You may also call Mark Pickerel @ (719) 406-8368 or by e-mail at firemark63@hotmail.com. The Pueblo Firefighters Historical Society is funded by Pueblo Firefighters, with help from fundraisers throughout the year, and by IAFF Local 3. The historical society owns the building @116 N. Main St. (the Pueblo Firefighters Historical Center) where we display the antique fire trucks owned by the historical society, and the operation of the Hose Co. No. 3 Fire Museum. The museum has been added to the Colorado Most Endangered Places list for 2019. This will help us get the exterior of the museum refurbished and looking great. We will send you a receipt, being a 501(c)3 entity, all donations are tax deductible. The old patches of the Pueblo Fire Department.